Balcony paint systems will waterproof, seal and protect walkways against light to medium pedestrian and manually wheeled traffic. 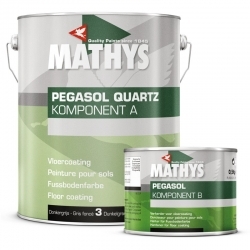 These high-performance, hard wearing and heavy-duty floor paints can add years of protection against the elements on surfaces where pooled water can be commonplace. 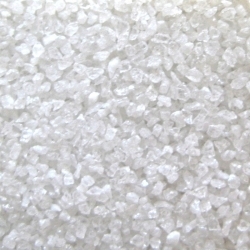 In sealing gaps, cracks and small holes, balcony floor coatings will prevent the substrate’s penetration from water, snow, sleet, ice and moisture – adding longevity and durability to balcony walkways on housing developments, private commercial properties, hotels and leisure centres, and factory external access points and fire escape routes. Balcony walkways are frequently exposed to harsh cleaning materials, as algae, moss, and bird droppings are cleaned on periodic maintenance checks. 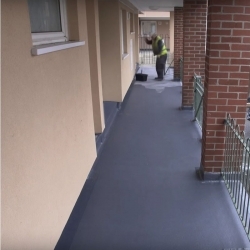 Balcony flooring restoration and rejuvenation products available to buy at Rawlins Paints offer chemical resistance to these liquids and will help prevent discolouration of the concrete or stone from bleaching. Sikafloor 405 is a one part, pigmented, highly elastic, solvent containing, UV resistant, moisture triggered curing polyurethane resin coating. Sikafloor 405 is a slip resistant, waterproof, crack-bridging coating for concrete, cementitious screed substrates and tiles. 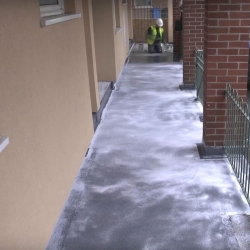 Tordeck DSP is a super-high solids two pack epoxy resin based primer used for the suppression of vapour pressure effects to prevent air/moisture blistering on suspect concrete and asphalt balcony surfaces, suspended decking etc, prior to application of Tordeck two pack systems. Also used in conjunction with Florex Solvent Free Floor Coating. Tor White Aluminium Oxide Grit (SS5001030 / SS5001050) is a wear resistant aggregate for the enhancement of slip resistance in Elastadeck balcony coating systems. Available in 30 and 50 mesh sizes. 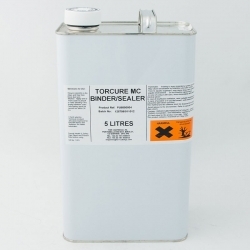 Torcure MC Binder/Sealer (PU885) is a single component, moisture curing polyurethane resin solution for use as a stabilising sealer and primer for use on a wide range of substrates such as concrete, asphalt, bitumen, felt, asbestos, plaster, render, etc. 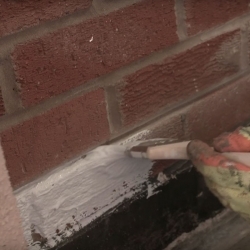 These balcony waterproofing systems can be applied as liquids - protecting around downpipes, external pipe casings, rainwater outlets and protrusions better than sheet materials had previously been able to. 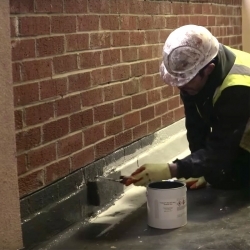 For balcony repair projects, it is recommended before applying the floor sealer that any ‘less than superficial’ damage – more substantial than hairline cracks, divots, impact or potholes – are repaired with a suitable concrete repair product. 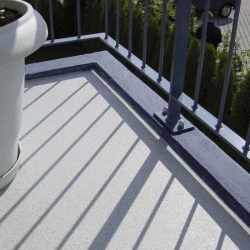 The added flexibility of these balcony paints means that as well as offering anti-slip and anti-skid properties, they will not split under increased pedestrian traffic load – nor will they degrade on high-build balcony walkways from UV exposure during long, hot summer months, and gale-force winds and snowstorms over the autumn and winter months. Seaside and coastal locations’ increased salt levels in the air are protected against, too. 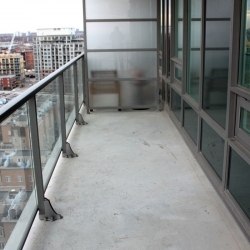 Prior to applying any balcony paint system, the downtime must be taken into consideration for access. 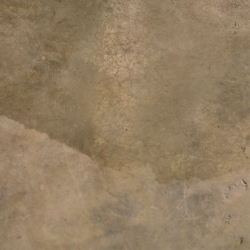 All products will contain full details of drying times, when they can be recoated and the recommended temperature for optimal application coverage. If you have any questions or concerns about the balcony floor systems available to buy at Rawlins Paints, please contact a member of our technical support team.